Writing a book is hard. Like, really hard. It's like climbing a rope or doing hip-hop- it seems pretty simple when you see it happen; you don't really know how hard it actually is until you try it. I was explaining this to a friend the other day (who I think was asking me, "Kasey? What's the deal with that book you were writing? Isn't it done yet?" and I was like, "It's haaaard.") and I started to wonder if anyone else has had a similar experience to mine when it comes to writing. I mean, you pick up a book and read it and I think it's easy to just assume that the story was just there in the author's head and they just sat down one day and wrote it. That's not how it works, people. Not by a long shot. Here's my list of 6 Reasons Why Writing a Book is Harder Than I Thought. Do any of them ring true for you? 1. It's puzzling. I've learned I'm pretty good at writing, but only marginally capable at storytelling. I don't think up a story all at once. I get little bits at a time. The story comes in odd, mismatched pieces, with random scenes and curious characters showing up at various points in the process, while all the while I'm trying to piece them together into some sort of coherent whole. I often think this might be much easier if the reverse was true. 2. Directions, please? Thanks to the above, it's easy for me to get lost in my story. I need directions. But there's no map. Or GPS. Or little old man sitting outside a convenience store who can tell me to turn left at the field with the brown cows. So I find myself writing a scene and then going, "Wait- when was the last time these two characters saw each other? I think I wrote that part like 6 months and 4 chapters ago. I don't even remember what they said. What do they know? How will they feel seeing each other again? Do their reactions even make any sense?" 3. That awkward creative amnesia. 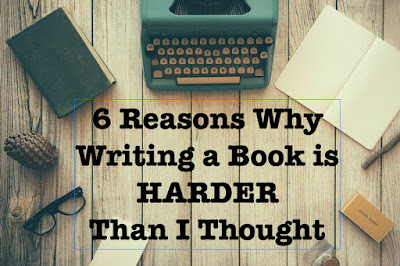 Along the same lines of #2, I often go on writing binges when I'm hot and heavy with my MS for several weeks, then I have a cooling off period for months. So when I get back to it, I think I'm doing okay, and then a few weeks in I realize there's a whole other character I'd written before whom I'd completely forgotten about, and now I have to find some way to work him back into the story. It's awkward. 4. Details, details, details. I never imagined that I'd be looking up times for sunrises and sunsets during specific times of year, or creating my character's entire family tree just to give myself a framework from which to write, or researching horse medications and symptoms of smoke inhalation. I feel like every few chapters I'm stumbling over an odd little detail which, if not pursued by hours of research, might break the integrity of my whole book. 5. Notes. So many notes! When you're writing a novel, and doing it in this haphazard, as-the-inspiration-hits kind of way like I am, you end up with a lot of random notes written on whatever is handy when inspiration strikes (see my last post, The Problem With Muses). So I make these notes and leave them places, and then I try to figure out exactly where that awesome idea I had last week in the car on the way to the dentist went...and of course 3 weeks later I find it under the seat in my van, scrawled on the back of a school fundraiser flyer, stained with something I hope is soda. And then I realize it doesn't really matter now anyway, because I dropped that scene a week ago. *sigh* I literally spent 3 hours last week collecting & sifting through my pile of hastily-jotted notes just trying to find some semblance of organization. So for those of you who have successfully completed this process and have written an entire, fully coherent manuscript, you are my heroes. I bow to your greatness. I aspire to the top of that mountain of accomplishment, and I hope to join you there one day, when I'm finally finished slogging through the swamps of my own creative muck. The good news in all of this is that maybe- just maybe- I'll learn something from this headache and the second book won't be quite this hard. Did I mention that this is haaaard? I think the hardest part is the editing!!! It's like it's never done...you always find something new that needs to be changed, sigh. Oh man, isn't that the truth! I'm actually kind of terrified to think of my story in print- that will mean I can't CHANGE anything!! Yes!! I finished a first draft and thought, a couple months of editing and I'll be good, but I keep finding sub plots that I dropped, or details that I didn't keep consistent. It's hard to hold it all in your head, but so rewarding. For keeping track of random ideas though... I use evernote, an app on my phone, then I'm never searching randomly for them. i might have trouble deciphering some stupid auto correct, but they are all there in a neat little folder. I don't know how professional writers do it every day! I think of John Grisham who puts out a novel a year, holy moley! It IS hard!!! I over-edit all the time! !